Nick Pivetta will start next Saturday against the Braves. CLEARWATER, Fla. -- Bryce Harper won’t go 0-for-the-Grapefruit League. Harper notched his first hit in a major-league spring-training game, a single to center field in the fourth inning of the Phillies’ 3-1 loss to the Tigers on Wednesday at Spectrum Field. He finished 1-for-2 with a walk and a run scored and is 1-for-10 in six Grapefruit League games since signing his 13-year, $330 million contract on March 2. But it was the performance of another player that had manager Gabe Kapler raving. 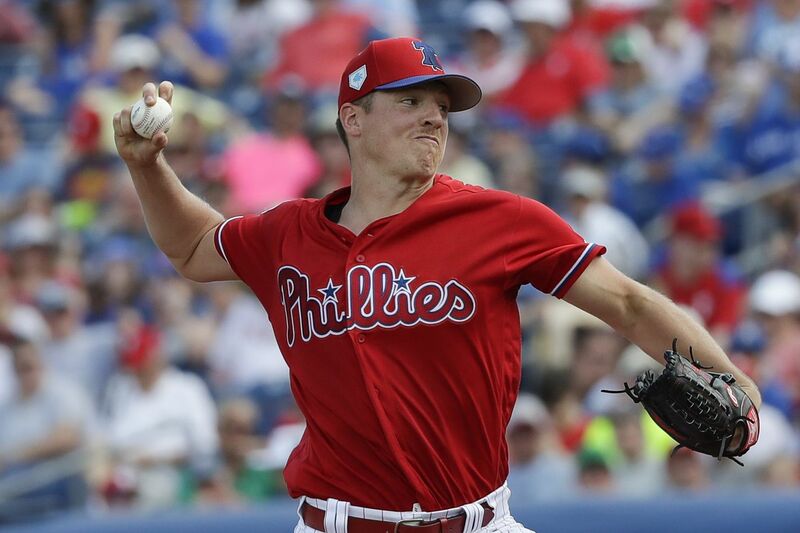 Nick Pivetta gave up three runs on three hits, including Josh Harrison’s solo homer, in five innings, but also racked up eight strikeouts and exhibited electric stuff in his second-to-last start of the spring. Pivetta is lined up to start the season’s second game on March 30 against the Braves. Jake Arrieta will start on March 31, a nationally televised Sunday night game. Pivetta is a popular choice to be the Phillies’ breakthrough player. At age 26, he’s working to incorporate a change-up into a repertoire that features a power fastball and a good curveball. In 32 starts last season, Pivetta posted a 4.77 ERA but also struck out 10.32 batters per nine innings, the 12th-highest rate among pitchers who qualified for the ERA title. Those who were ahead of him: Gerrit Cole, Max Scherzer, Justin Verlander, Trevor Bauer, Jacob deGrom, Patrick Corbin, Blake Snell, Carlos Carrasco, Charlie Morton, German Marquez and Luis Severino. The Phillies notched only six hits against four Tigers pitchers.